Ever had this happen? It’s quite a shock and a lot of dismay. Today when I went to sites I visit often I noticed the Username and Password field weren’t automatically filled out like normal. So I went to the password manager in Chrome and everything had disappeared! Well I found a solution HERE on a Google Groups discussion board. It seems to have worked. This is for a Mac. What you do is first quit Chrome. Then you go to Applications>Utilities>Keychain Open up your Keychain Access program and all of your passwords should be in there. Mine were. Then you re-open Chrome and all the passwords and sites are re-populated in the Password Manager in Chrome. At least it worked for me. Whew! 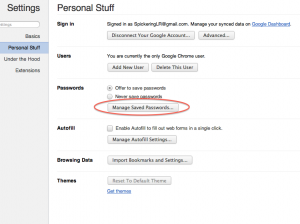 The Passwords in Chrome are in Preferences>Personal Stuff>Manage Saved Passwords. Hope that helps. Let me know. 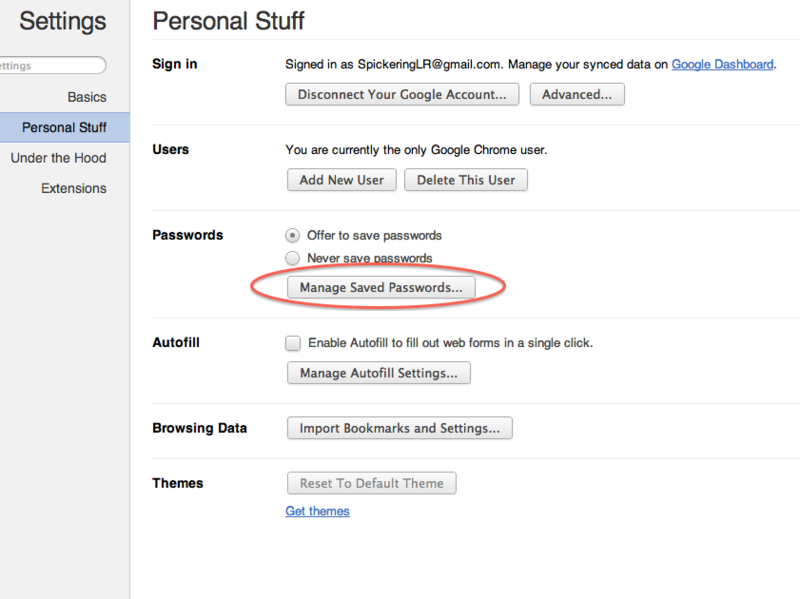 This entry was posted in Security, Tech and tagged Chrome, Mac, Passwords on April 9, 2012 by Stephen Pickering. Phew, just happened to me ! This trick worked forme, Thanks a lot ! This worked for me too! Thank you.